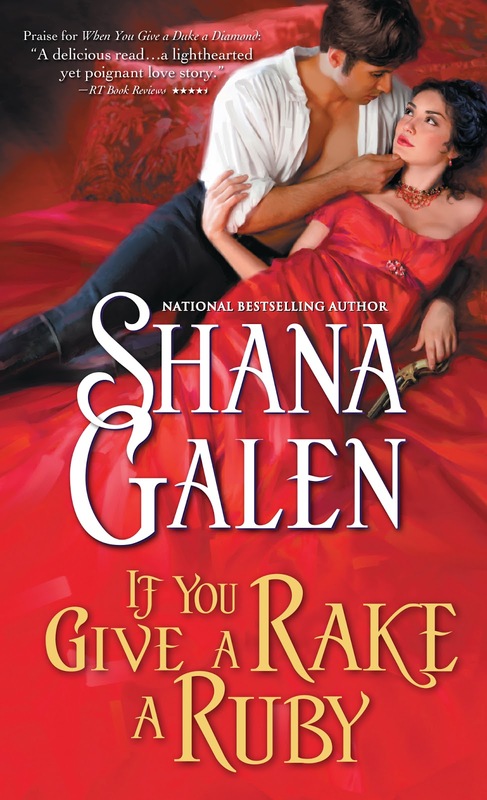 Reading Between the Wines Book Club: Review: If You Give a Rake a Ruby by Shana Galen - 4 Wine Glasses! Fallon is the second Jewel of the Ton, the red cover is a good indication of her personality. Her past is a troubled one, but you get to see how that sharpened her edges to turn her into the ruthless woman she is today. Makes you wonder if anyone can break through her tough skin. Warrick is one determined man with the right amount of push to crack Fallon. These two blunder about, uncovering truths and finding answers they both desperately need. This man who has such control looses himself against Fallon, the chemistry between the two is the hottest Galen has written. Their chemistry isn't the only hot thing she wrote in If You Give a Rake a Ruby...just pick up the book and find out what else sizzles. Yet again Galen leaves us with clues and questions. The Earl and Lady Sinclair have gathered quite the trio, they bring love and trouble when they are together. The third Jewels of the Ton book will be out next March. Until then we will have to be satisfied with rereading books one and two. Rating: 4 Wines! Love this HR! Awesome review! I read the first one and just LOVED it so I can't wait to get my hands on this one. Its always fun to see a couple blunder around each other...it makes the story that much more of a fun read.